Where did you go, Dubai?? Dubai has officially disappeared. Really. I woke early this morning and decided to come downstairs and get the coffee started…… while waiting on the dripping thing (miss my Bunn coffeemaker!!) I peeked outside, and holy COW is it foggy in Dubai!! I snapped this at 7 am local time, and you still cannot see past my back gate – looks like I’ve found the end of the world. There’s tons of trees and buildings and a lake past that gate, but you can’t see any of it for the fog. Kinda like nothing else exists. It seems to be a winter thing here, and the wrecks in the fog are legendary. Multiple car-pileups were common, as inexperienced drivers continued to drive in the fog as they have in clear weather. Some people here will turn on their 4-way flashers to drive in fog, which is really confusing – westerners think of that as a stopped vehicle in distress. Thankfully, over the past few foggy days, there have been few crashes, and we’ll hope it continues. 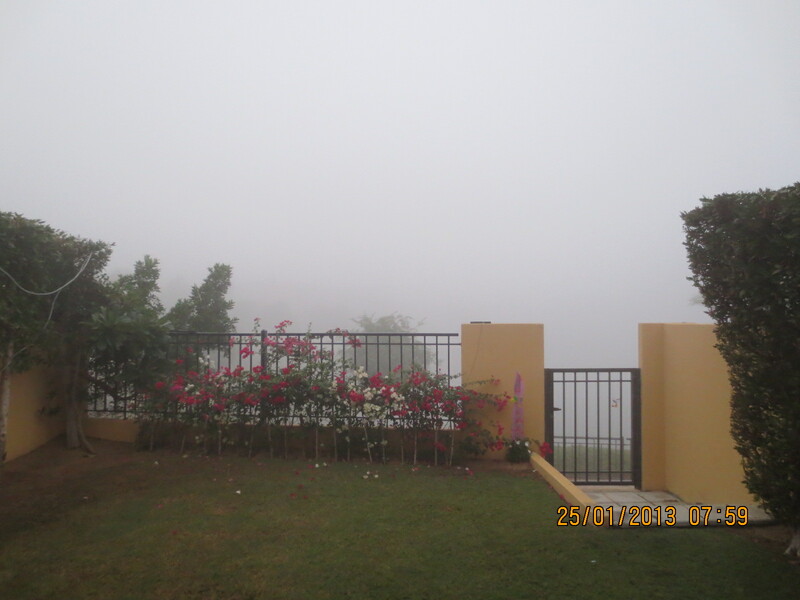 But from where I look, it sure looks like Dubai has disappeared!